Early on, retail technology innovations were focused on helping improve back-end operations. Now, the trend is toward customer-focused technologies that make shopping easier, faster, more personalized, and more entertaining than ever before. You can correctly anticipate a shopper’s needs and deliver the exceptional service they want. Toward that end, mobile applications are no longer an advantage, they are a necessity. 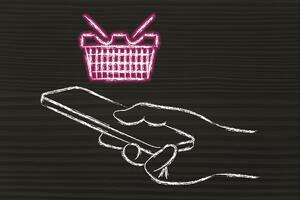 Technology that simplifies the shopping process puts your store at the top of the list for customers. Self-help technology is increasingly popular, not only for checkout but for learning about products and customizing them in-store. Shoppers now expect to have post-purchase options such as in-store pickup or next day (or even same day) at-home delivery. Retailers have used in-store kiosks and other digital media for years. But new technologies are transforming stores into truly multi-media, multi-channel environments. For example, 360-degree video literally adds new dimension to visuals that tell lifestyle stories about merchandise. Retailers are starting to use artificial intelligence, but expect to see the trend grow. Due to the ability to better understand customers and their shopping behaviors, it will be easier to individualize both marketing and in-store experiences. Chatbox technology, widely used online, can also assist customers in-store. More than merely analyzing data and applying it “next time,” AI enables you to modify your approach to each customer in real-time — from the moment they enter your store, giving new meaning to the concept of personalization. And, just as AI now facilitates dynamic pricing online, experts predict that opportunity will one day be available in-store as well. With digital product and price information on shelves, store associates can instantly change pricing or other details to reflect promotions, etc. without having to reprint paper labels. Electronic rack edges give your store a high-tech visual upgrade, too. Mobile payment applications are a growth industry. In 2015, shoppers tapped their phone to pay for $8.7 billion in purchases. By next year, that figure is expected to reach $210 billion. Adopting this technology can relieve store staff of “checkout duty,” so they can focus on helping customers in other ways. Geofencing enables you to digitally “mark” an area around your store. When a customer gets near, you can detect their mobile device and send them a message such as a use-now special offer. In the store, high-tech mannequins use GPS to detect a shopper’s presence, then explain the outfit they’re wearing. Since GPS also enables you to collect customer data, you can gain deeper insight to create “smarter” promotions. And, coming to a supermarket near you (someday), shopping carts outfitted with GPS-enabled touchscreens. Input your list, and the map will direct you to each item using the most efficient route. Click to pay as you pick up each item, and you’ll be out the door in no time. No checkout line needed. The key to success with retail technology is knowing which trends are most relevant for your store and customers. By paying attention to the trends, you can zero in on choices that will bring the greatest value to your customers and the greatest return on your investment in 2019.